It is simple to say eating healthy is always easy. Even though 90% of the German population knows what belongs to a healthy and balanced diet, only one in three persons manages to implement this in everyday life. This was revealed by a survey held by the „Bundesministerium für Ernährung und Landwirtschaft“ (BMEL) and „Bundeszentrum für Ernährung“ (BZfE). We know this problem too well, even if we have the advantage of working at home and having a well supplied fridge plus the opportunity to cook whenever we want to. How often did we sit at our desks with growling stomachs because we forgot to eat while working. But instead of reaching for unhealthy fast food we developed strategies how to eat healthy in even stressful situations. Why shouldn’t these approaches help others to integrate a healthy diet in their everyday life? This is the approach of a great project we’d like to present you. Together with the BMEL, the BZfE started the nationwide call for ideas “Vom Wissen zum Handeln” (Of Knowledge to Act). Until 30th November 2017, ideas and practical approaches or even realized project concerning healthy diet can be handed in. It can be a specific suggestion, an approved experience or even a creative action or innovative campaign. A basic recipe which can be transformed easily with simple measures into 5 different dishes. One of our strategies to include a healthy diet into our everyday life is precooking. It is the perfect way to enjoy meals made of good ingredients even on stressful days effortlessly. We thought about how we could simplify and optimize this process of precooking. The outcome is the idea of “5 out of 1”. We have a basic recipe which is transformed into a new dish with only two additional ingredients. You can prepare a bigger amount at the beginning of the week and for the rest of the week, cook a fresh, balanced and varied meal in 10 minutes maximum. How this could look like we want to show you with an example. 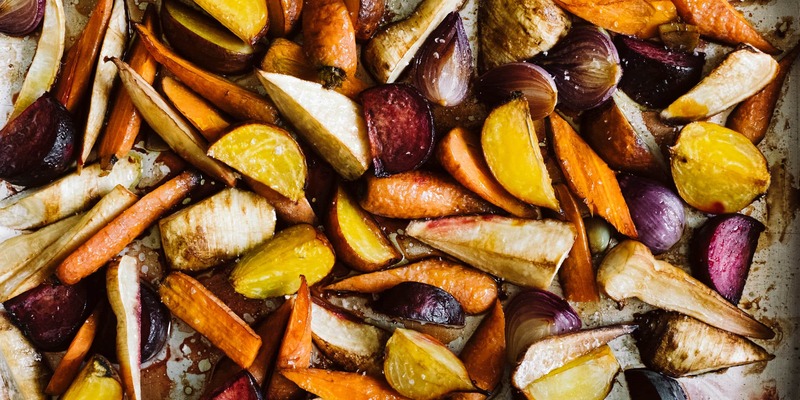 We have one recipe which sits enthroned on our list of “fast and easy dishes” and we thought this might be the ideal basis for our “5 out of 1” action: roasted vegetables. It varies from season to season, yet it is always pretty easy. The vegetables are cut into pieces and seasoned with a dressing before it is put in the oven. 15 minutes are needed for preparation, another 35 minutes can be used to do something different while the vegetables are roasting. Based on this we developed five different recipes: hummus with roasted vegetables, a soup, a spread for bread, salad and a pasta sauce. To give a concrete notion of our “5 out of 1” idea, you find a basic recipe and our 5 easy variations subsequently. Preheat the oven to 180°C. Brush the carrots, beet roots and parsley roots thoroughly or peel them, then cut into pieces. Halve the onions, slice the garlic and spread on a baking tray and salt everything. 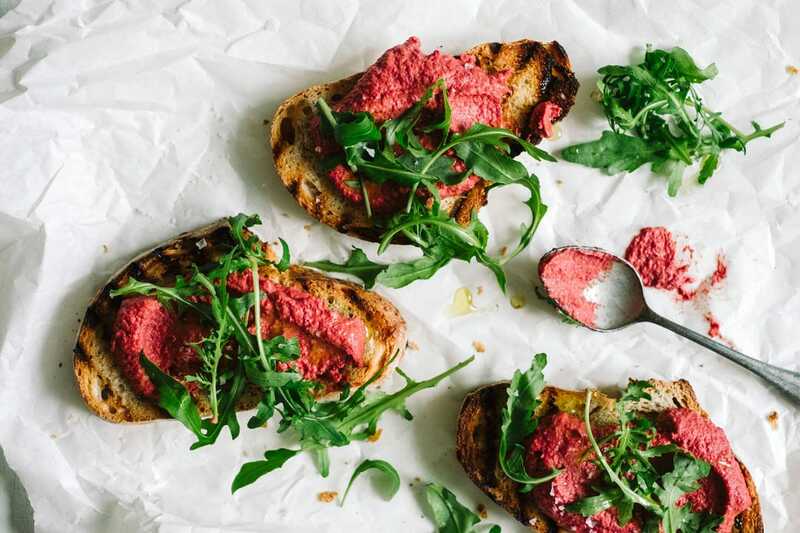 Put the beet root a bit aside, since we do not use it for every following recipe. Mix olive oil, vinegar and maple syrup as a dressing and sprinkle it over the vegetables. Bake in the oven for 30-40 minutes until the vegetables are soft (test with a knife). 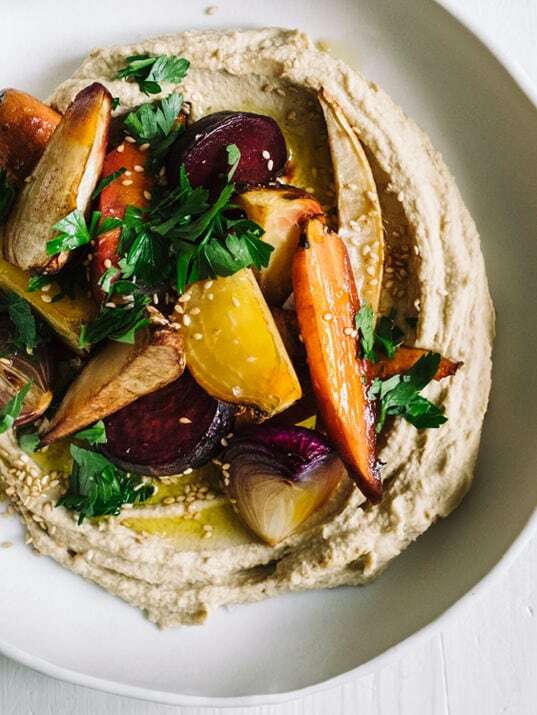 Arrange 200 g of the freshly baked vegetables on 200 g hummus. Sprinkle it with a bit of olive oil and garnish the dish with chopped parsley and sesame, and you have a quick and colorful lunch. 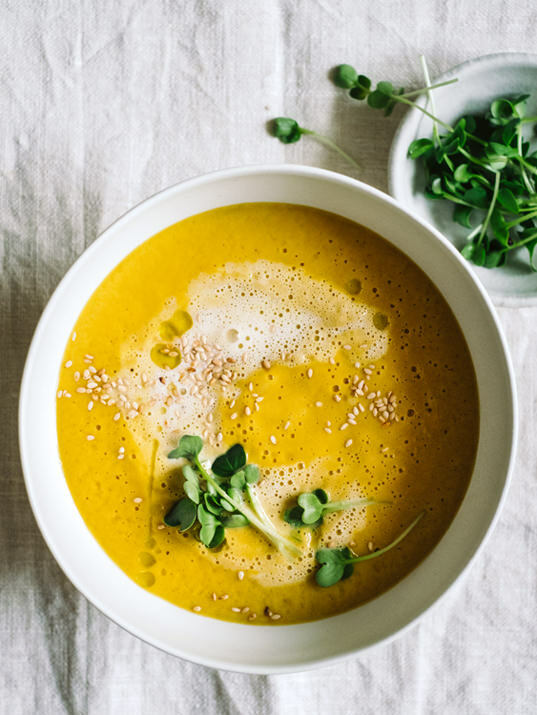 To get a creamy soup, blend 200 g of the roasted vegetables with 300 ml vegetable broth and 100 ml coconut milk. If you like, you can add fresh ginger, ground cumin and coriander seeds. Finally, season with salt. Roast 40 g sunflower seeds. Together with 120 g baked vegetables, 60 ml water and a tablespoon of the vegetable juice, which is left on the baking plate after roasting. Purée it until you have a creamy spread. Season with salt. 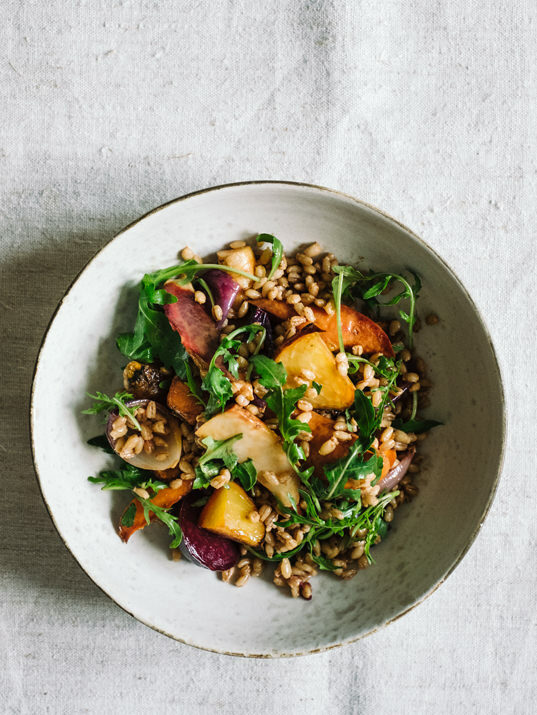 For a warm or cold salad dice 300 g of the roasted vegetables and mix it with 150 g cooked barley and a handful of rocket. The vegetable juice left on the baking plate after roasting is used as a dressing. Mix 50 ml of it with Dijon mustard and mix well with the barley and vegetables. If needed, add salt. The vegetables also qualify excellently as a basis for a sauce. For this, purée 80 g of the roasted vegetables with 80 ml water and 2 tbs tomato paste. Season with salt and maple syrup. 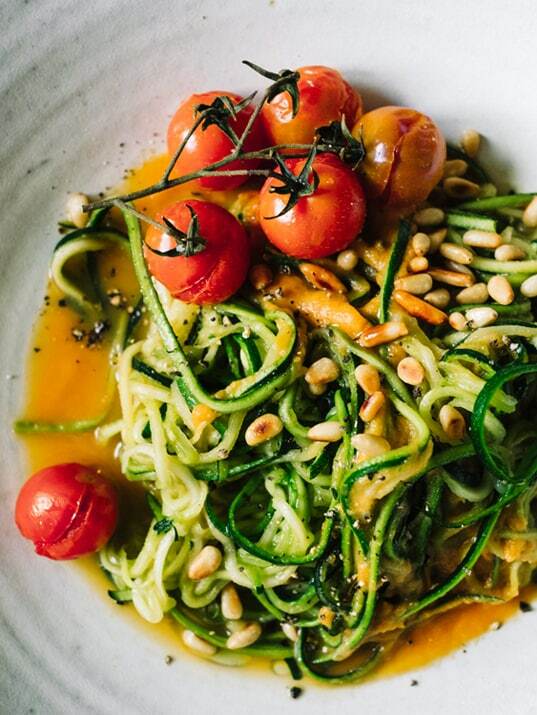 We love to eat the sauce with (zucchini) pasta and add roasted cherry tomatoes and pine nuts. *This article was written in cooperation with the “Bundesministerium für Ernährung und Landwirtschaft” and the “Bundeszentrum für Ernährung”. We had free reign over content and text.